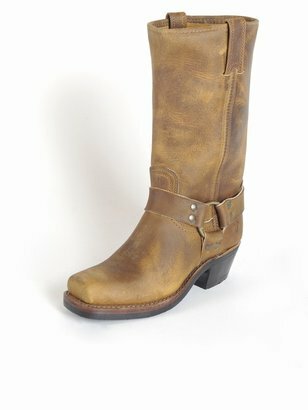 The Harness by Frye is quite possibly the perfect distressed leather boot that you can purchase for $218 at shoptheshoebox.com. For a limited time, use code THANKS at checkout to receive 20% off your order, bringing the price of these bad boys down to $174.40. Good news if you've wanted this look for less: Target.com has restocked the Mossimo Supply Co. Katherine Leather Engineer Boots in both Dark Tan and Black . I love my pair! A word on sizing: Usually I'm a 9 with Target shoes, but I definitely needed a 9 1/2 with these boots. They are not very wide and require some breaking in, but since they're real leather, this isn't a huge problem. Thanks for the great tip, BB! I just love these boots and have admired them for far too long. This post inspired me (I guess you could say that!) to buy them on Target's website. It will be 2-6 weeks before they arrive, but I anticipate they will be worth the wait! I've been eyeing these boots for MONTHS. Perhaps now I'll buy them - an early birthday present? I can justify them, I'm sure! I was looking at those Target ones last week. Still debating between those and cowboy boots. I have the exact same boots but they are Harley's. I bought them about 1 year ago and I was obsessed with getting the Frye boots. However, I went to a shop that had them both and side by side, the only difference between the Harley's and the Frye is the logo which is imprinted in the leather. The Harley's were cheaper and slightly more comfy. I looooove the distressed look but keep in mind, to keep them longer you actually need to moisturizing them with leather cream, and once you do that they become a darker. Which I don't like but thats okay. I bought mine at rockingleather.com for around 130$ with shipping using a coupon code. See if you like them too!